Offering you a complete choice of products which include silver plated bowl and silver serving bowl. Made up of brass and plated with micron silver, this hand chiseled punch bowl is a perfect example of form & function unified. These bowls act as classy decor pieces and are also used to serve punches, salads, fruits etc., in style. 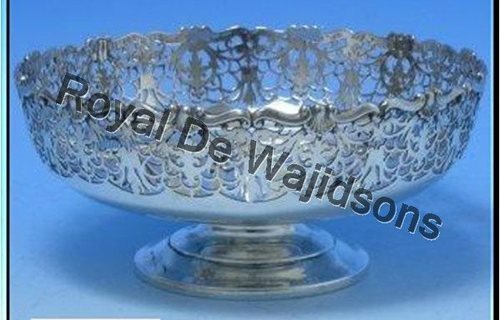 We manufacture variety of silver plated bowls and also cater to custom design needs. 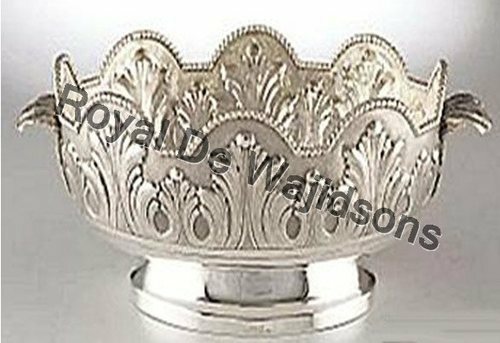 Silver Serving bowl offered are available in designer patterns and classic styled finish. The serving bowls are just perfect for laying a table as it adds grace and beauty to the dining table. Further, the refreshments served for any occasion look picture –perfect when provided using these attractive and functional bowls. The elegant look and fine finish of these bowls also gives a feel of graceful luxury to the cuisine offered. Available in wide range of designs these serving bowls are available in vibrant hues of colors. These serving bowls are also an excellent décor for home or hotels. Available at affordable rates, these serving bowls are also very durable.